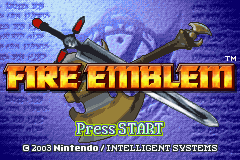 Were you actually expecting a custom title screen? As you can see, we don't have CHAPTERS, we have EPISODES! Makes more sense, right? 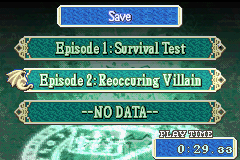 This hack doesn't really have a big, overarching plot, and the episodes themselves are relatively self contained. So I think this is one of the few wise choices I made in this hack. 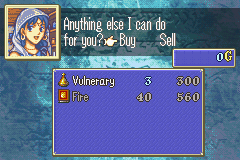 Believe it or not, the game does stuff with your name, so...this actually matters! The things I do with the Tact name... I look forward to this! 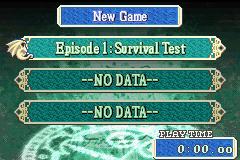 So...survival test, huh? Guess what the objective is! The chapter just starts. No dialogue or anything! Don't worry, that will change. 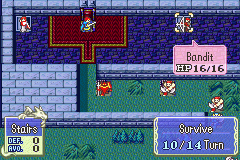 Anyways, there is EXACTLY ONE enemy, and he's on the fort. 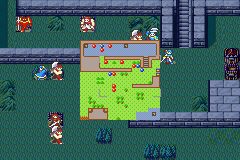 There's a bunch of allies too, but we're all scattered. This is history in the making! 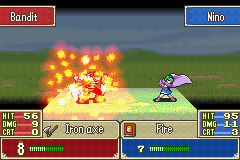 Old Fire Mumblem I think was made a couple months after Super Hard Lyn Mode was abandoned. I stopped FE hacking for a while since I felt that I couldn't really go much further with the current tools. Every now and then I would check up on the community to see if new tools were available and, lo and behold, Nintenlord eventually released the Event Assembler! 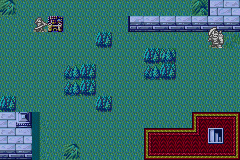 Excited to finally have full control over units, reinforcements, cutscenes, etc. I spent hours reading Arch's old eventing tutorial, experimenting and learning. The result? 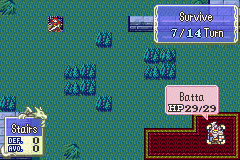 One of the first ever custom chapters in FE hacking history (The first ever I believe is Puchiko's "Eliwood Vs. Everyone"). 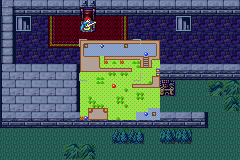 Though, this is not my first ever custom map. That would be the abandoned chapter 10 of Super Hard Lyn Mode. 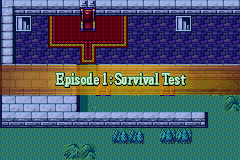 As you can imagine from the episode title and lack of cutscenes, I was more or less doing the same thing I did with Super Hard Lyn Mode; figuring stuff out, testing it out, gathering data, then moving on to more difficult things as I progressed. 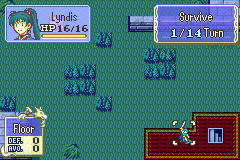 In Super Hard Lyn Mode, it was mostly small milestones, but Old Fire Mumblem has enormous leaps and bounds between chapters thanks to the power of event editing and the desire to impress my friend BuringPenitentEngine. 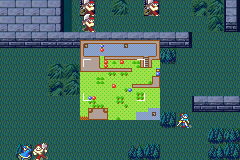 The map itself is some weird sort of pseudo-castle, with a big field of nothing outside it. The good news is, we have a throne to hold out on! 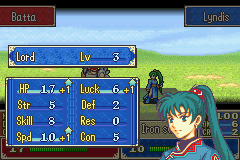 As our standard troops, we have the whole cast of FE7 lords, with standard level 1 sucky base stats! 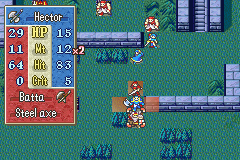 Of course, all of them except Lyn have useful backup-weapons, luck for them. 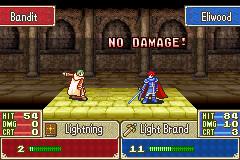 Mind you, Eliwood's gonna be doing most of the fighting, for reasons we'll see later. 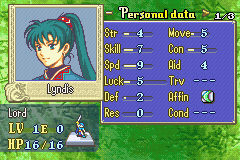 Also, no idea why Lyn is called Lyndis instead of just Lyn. 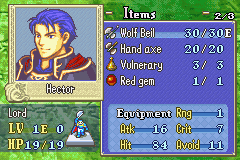 My memory is a bit hazy, but I think Hector's base stats are slightly nerfed. 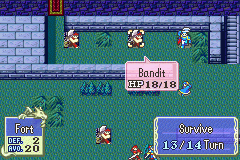 In the original game, he came at level 2. Here, he's level 1, so I figured it would make sense for his bases to be lowered a little. 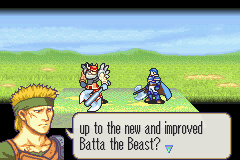 That, and I felt he was too good in the original game. Oh, right! There's one more, isn't there! It's Nino, everyone! 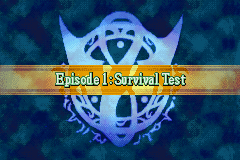 That's right, the est joins you in the prologue! 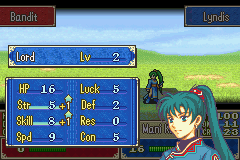 I'm not sure exactly what Marky did to growths, but I do know that he didn't nerf them, and so this lady becomes INSANELY OP if you actually train her. 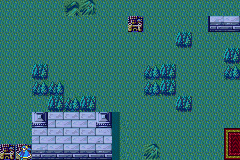 Which we're totally doing, because this isn't the type of hack you want to do a challenge run on. Nino's growths and especially her bases were nerfed. 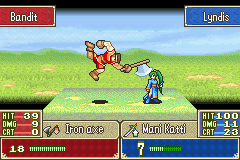 Granted, her growths weren't nerfed nearly enough. 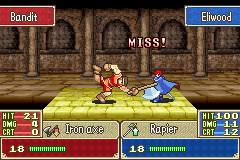 She is definitely a Top Tier unit. 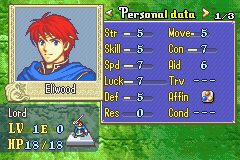 Though, I think Eliwood's the best unit overall. The one poor loser bandit moves out. 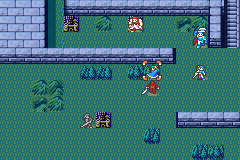 When suddenly, three more fighters! 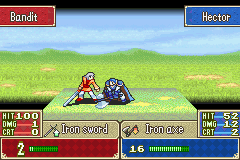 So yeah, that's basically the gist of this chapter. 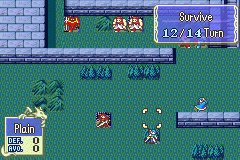 Survive for fourteen turns with four separated units while large amounts of dudes pop out in the space in-between them all. Let's get to it! 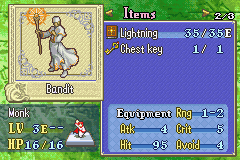 Oh, and some of the descriptions are switched out! I really like this one. Let's check out the shops! 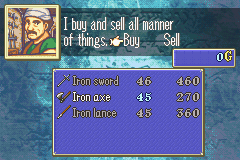 There's nothing you really need, but I sell Hector's red gem regardless. Shops... hoo boy. Self reminder: Talk about the shops once TheMoniker has gotten a few more episodes in! More fighters! 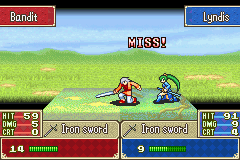 Lyn is heading to meet up with hector, Nino's kinda stuck right now, and Eliwood will NOT move one step from that throne for the entire chapter. 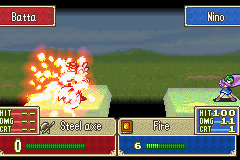 A third wave of fighters! Isn't this exciting? The first of many. Hopefully they're all this good. 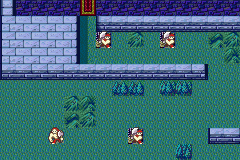 These are literally the wimpiest enemies ever. 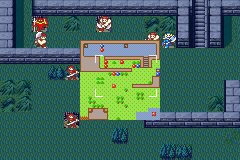 Oh, and these guys have chest guys for some reason, even though there aren't chests on the map! And we can't steal them! Care to explain, Marky? *Shrugs* Not a clue, chum! 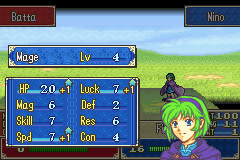 Nino's gonna need HP, she'll go down if both fighters hit her! 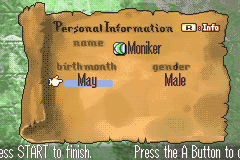 There weren't any more archers/monks, but some new classes joined the fray! 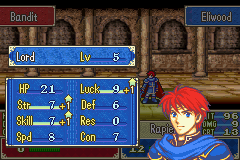 The myrms and armors are the main threat, but Eliwood can handle the armors, while Nino can't really handle the myrms. 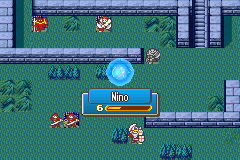 I think Nino can one-hit kill them with Elfire. 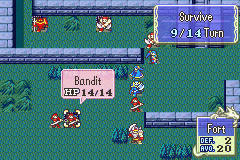 Most of the enemy units have much lower HP than normal in this chapter. 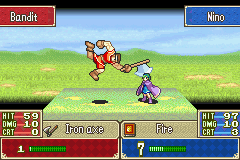 The weight makes the Myrms able to double her, but if you have Lyn hanging around, you can trade-equip her back to Fire afterwards. 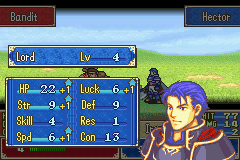 Actually, speaking of lowered HP, I just realized something. 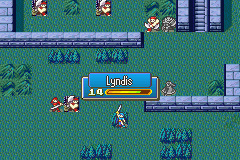 Instead of upping stats of enemy and player units like I did in Super Hard Lyn Mode, here, I was mostly lowering them, or just tweaking them slightly. Perhaps these were the first signs that I was becoming aware of this foreign concept called balance? 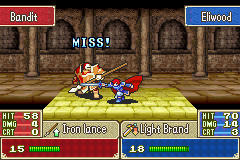 And this level isn't helping! 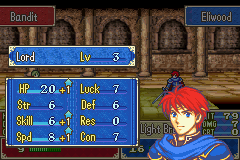 See Eliwood? 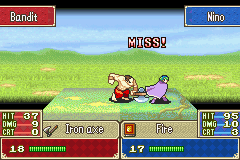 THIS IS WHAT HAPPENS WHEN YOU DON'T USE MAGIC. 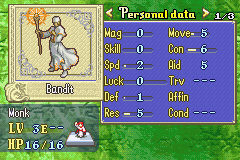 LOOK at those beautiful stats. LOOK AT THEM. 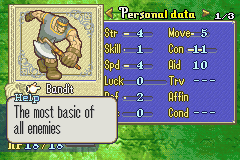 A promoted boss unit with bad stats... Here was my reasoning. Eliwood is still murdering, and gaining Eliwood levels. 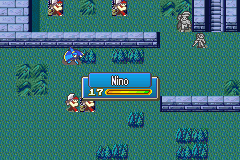 These myrms are aggravating, but luckily one was too interested in healing to pursue Nino. 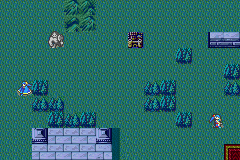 He's moving towards us, which is good and bad. More! Luckily, nothing special comes this time. A good level! Thank you! 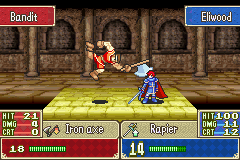 Are you SURE that hit, Hector? 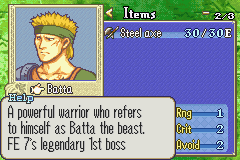 Okay, Batta will be a DIFFICULT, CHALLENGING, THREATENING, HAIR-PULLING OUT BOSS, but I'm sure we can beat him! I thought this line was clever. Hindsight makes me wonder why. Probably something like "OH MAN! I bet you thought this line wasn't changed!!" Right. So. Batta. 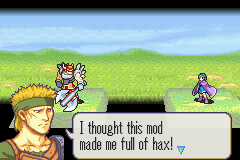 Hax. Conditional events. I love making fun of myself. Wouldn't it be AMAZING if the Est turned out horrible? 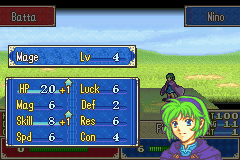 She hasn't gotten speed once, so I'm a tad worried to be honest! 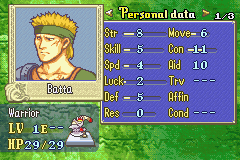 Okay, this time around I'm less eager to attack Batta, and choose to hang back a bit. 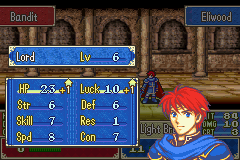 Hector rewards me with a beauteous level. Beauteous? Who are you? Sain? 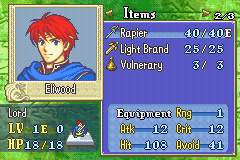 Eliwood is outpacing the others in level quantity due to his position, but not quality! That's really strange. 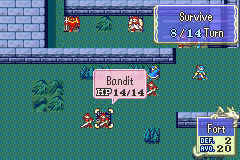 I recall him being really good. 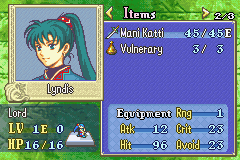 Lyn lures out Batta! 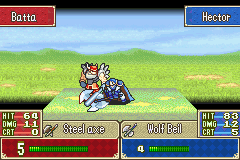 Look at my MASTER TACTICS! 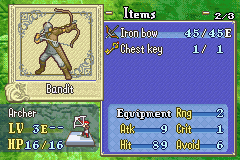 Another pirate/armor/myrm combo, and another archer/monk to back them up! Eliwood can handle them all, of course. Re-finished! 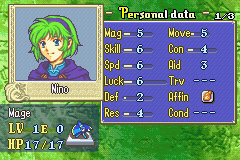 And Nino's level was, slightly, better! Here's a fun fact for ya. 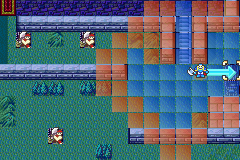 Did you know that you can block Batta's spawn point? 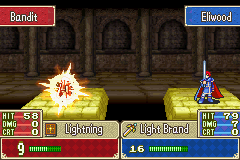 PwnageKirby did it in her LP, and I was like "God dammit!". 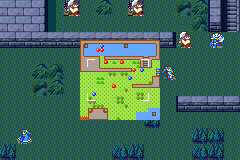 She didn't even know anyone was going to spawn out of that stairway. 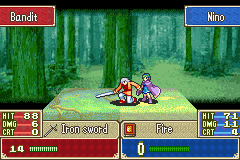 Oh, so we're back to fighters now? Honestly, this just isn't hard. 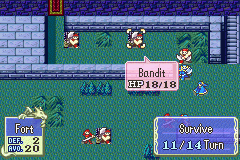 I know it's a bad chapter and all, but doesn't it make sense that it would be easy? It is the first chapter afterall. Though. It could have at least been easy in an interesting way. Starting with NOT taking 14 flippin' turns! Even if Eliwood isn't cooperating. 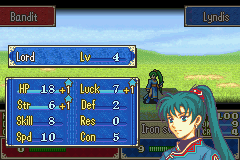 Hey Lyn, could you maybe get some defense sometime? Pretty please? 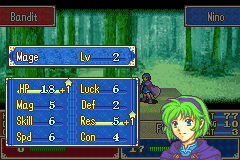 Lyn puts more effort in maintaining that hair than she does in actually surviving. This is fact. And now, back to the other type of wave for the "big finish"! What? 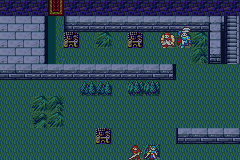 Switching back to fighters again? 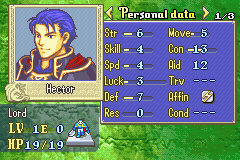 Hector's gonna be amazing, I can see it already. I get it, they were revolving back and forth for the last few waves! Oh man. 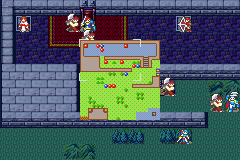 Changing up the reinforcement patterns in the last few turns? 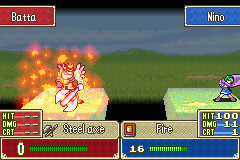 I'm so edgey. 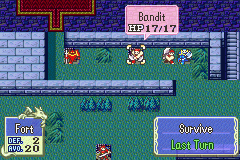 The only survivors were the pirate and myrm you see here. NEXT TIME: We gain witness to some pathetic semblance of a story!